Americas Best Value Inn and Suites Houston-Highway 6 and Westpark is a brand new modern style hotel with fresh Southwest designs. We offer the most value for your money when staying for business, pleasure, or just passing through. We offer beautifully decorated rooms and suites with modern furnishing and amenities, a 24-hour front desk and lobby, free coffee in lobby, free continental breakfast, business services, and free Wi-Fi throughout the property. Our guest rooms and suites include microwave, mini-fridge, hairdryer, 50 inch flat panel satellite TV, HBO, ESPN, iron, ironing board, and clock radio. Take advantage of our extremely comfortable beds and relax while saving money year-round with our Kids Stay Free Policy (11 and under in parent's room). For your convenience, our hotel offers both smoking and non-smoking rooms and suites. Sorry, no pets allowed. We are located off Westpark Tollway on Highway 6 South (Addicks-Howell Road). We are near several local attractions such as FUNPLEX Amusement Center, Houston Museum of Natural Science at Sugar Land, and Downtown Aquarium. Americas Best Value Inn and Suites Houston-Highway 6 and Westpark is your best choice within the Texas-Oklahoma boundary. We offer ideal accommodations and location whether you are in town for fishing, shopping, entertainment, or music and food festivals. At Americas Best Value Inn and Suites Houston-Highway 6 and Westpark our goal is to provide our guests a great experience, not just a place to stay. 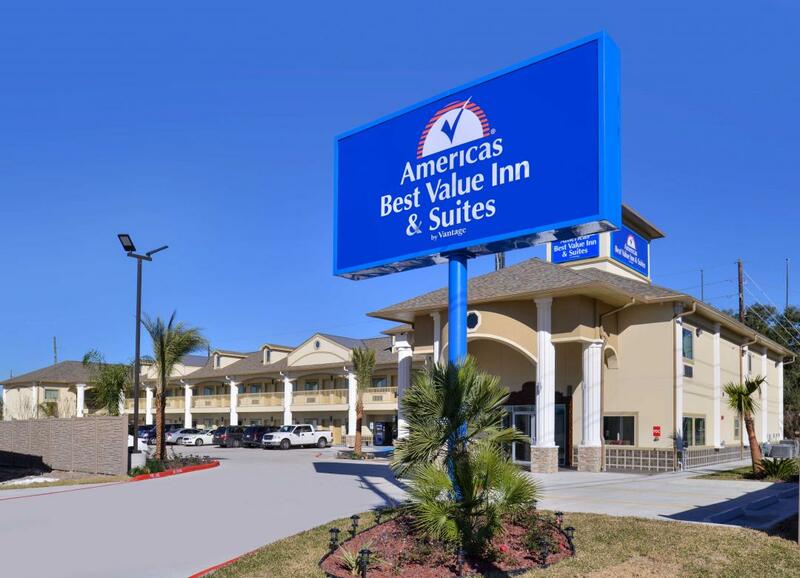 At Americas Best Value Inn and Suites Houston-Highway 6 and Westpark, We've Got You Covered from the time you hit the road until your head hits the pillow. Papa John's Pizza, 0.3 mi. Greek Lane Bistro, 1.3 mi. Check out these Houston attractions during your stay. Bollywood Cinema 6, 0.6 mi. West Oaks Mall, 0.7 mi. Edwards West Oaks Mall 14 and RPX, 1.1 mi. Touch N Go Massage, 1.2 mi. Bishop Fiorenza Phase II, 2.4 mi. Wind Chimes Cinema, 2.5 mi. Alief Family YMCA, 3.2 mi. 24 Hour Fitness, 3.4 mi. New Thai Massage, 3.7 mi. American Fishing Charters, 3.8 mi. Dairy Ashford Roller Rink, 4 mi. George Bush Park, 4.4 mi. My Spa Lounge, 4.4 mi. Royal Oaks Country Club, 4.6 mi. Foot Spa Reflexology, 5.8 mi. Cru Day Spa, 5.9 mi. Lakeside Country Club, 6.5 mi. Willow Fork Country Club, 7.4 mi. Sharpstown Swimming Pool, 9.1 mi. Life Time Athletic, 9.3 mi. Studio Movie Grill, 9.8 mi. Memorial City Mall, 11.9 mi. Cinemark 19 and XD, 12.3 mi. FUNPLEX Amusement Center, 3.9 mi. Houston Museum of Natural Science at Sugar Land, 10 mi. Zuma Fun Center, 10.6 mi. Museum of Southern History, 10.7 mi. Sugar Land Ice and Sports Center, 10.8 mi. Gerald D. Hines Waterwall Park, 12.8 mi. Times Square Entertainment, 13.3 mi. Houston Arboretum and Nature Center, 15.3 mi. Jumping World USA, 17.9 mi. The Houston Museum of Natural Science, 18.2 mi.